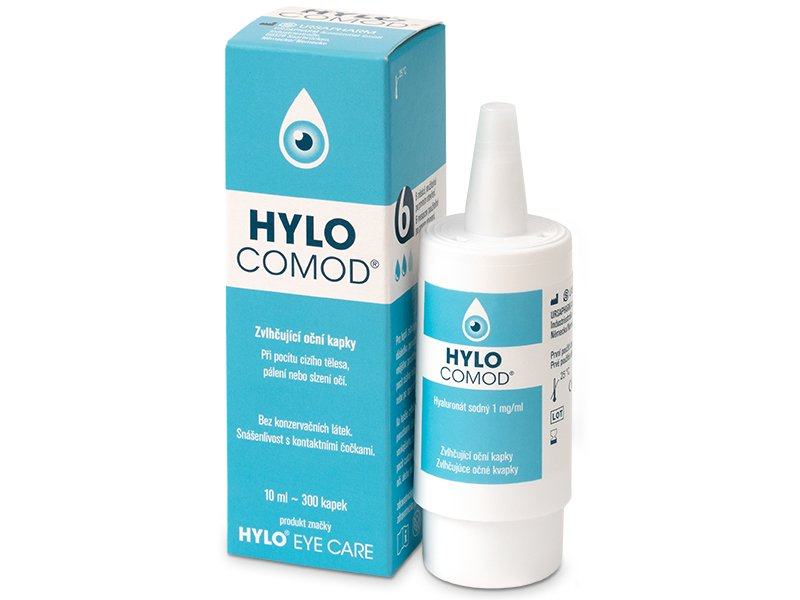 Hylo-Comod eye drops help relieve discomfort associated with dry and irritated eyes. Hylo-Comod's preser­vative-free formula is gentle and mimics the effects of natural human tears. HYLO-COMOD are lubricant eye drops developed by the pharmaceutical company Ursapharm to provide optimal moisture for dry and irritated eyes. 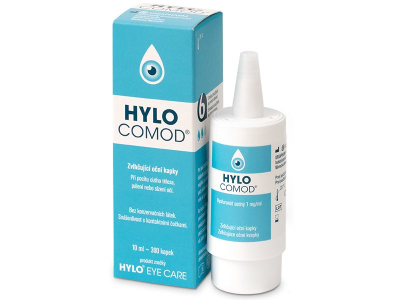 HYLO-COMOD eye drops do not contain preservatives or phosphates, which can cause irritation of the sensitive eye tissue, so they are exceptionally gentle. They can be used without a medical prescription with all types of soft contact lenses. These drops contain the moisturising agent known as hyaluronic acid, which is important for maintaining the regenerative properties of the cornea. Hyaluronic acid is a substance fully compatible with the human body and can be found in tears, joint fluid and the eyeball. It forms a protective cover on the surface of the eye, which prevents dryness and ensures that the corneal cells are sufficiently moist. HYLO-COMOD eye drops provide relief from feelings of pressure, burning and dryness in the eyes. They are also suitable for wetting contact lenses. These drops are suitable to be used as often as needed for comfort. After opening the bottle, it is necessary to discontinue use and discard within six months. Each bottle of HYLO-COMOD eye drops features a special COMOD® applicator, which eliminates the possibility of contamination by micro-organisms and also ensures accurate dosing with every use. Hi, Karolina, We're thrilled you're enjoying our product -let us know if you've got any questions! For a long time i've suffered with dry eyes and slight irritation. This helps me deal with it. My eyes feel alot more hydrated when using these. Best price i've seen for this. Always good to add it to my basket when shopping online. Helps keep my eyes functioning after a long day. what is the % of sodium hyaluronate ? Hi, It only has 0.1% of sodium hyaluronate.